Getty ImagesConor McGregor and Nate Diaz went to war twice in 2016. In the 25 years that followed UFC 1, fans have witnessed the rise and fall of many champions and seen many great fights – but which have been the best? 13: Robbie Lawler successfully defended his UFC welterweight title with a split decision win over Carlos Condit in a “Fight of the Year” winning performance in 2016. 12: Forrest Griffin bested Stephan Bonnar in the season finale of the The Ultimate Fighter 1. The 2005 “Fight of the Year” is seen as the battle that transcended the sport and sparked widespread interest in UFC. 8: If you like nasty elbow strikes, a blood-soaked cage floor, and a last-gasp stoppage finish in the fifth round, then you’ll love Anderson Silva’s win over Chael Sonnen, via triangle armbar, at UFC 117 in 2010. 7: You know you’ve watched a classic fight when both fighters are battered and bloodied but pose and smile for photos with each other at hospital, long after the final bell. Jon Jones edged Alexander Gustafsson at UFC 165 in 2013 in this must-see war. 6: There’s an old saying in the fight game that goes something like this: “Every great fighter has one last great fight in them.” For Chuck Liddell, the action-packed three round classic with Wanderlei Silva at UFC 79 in 2007 was his last great fight. 5: UFC lightweight champion Frankie Edgar put his belt on the line for a five-round ruckus with Grey Maynard at UFC 125 in 2011. Both fighters swung their fists until the finish and left the Octagon with a draw. 4: Robbie Lawler and Rory MacDonald’s slobberknocker spared no drama. The two fighters traded blows and spewed blood — but there was one decisive winner as Lawler won via knockout in the fifth round at UFC 189 in 2015. 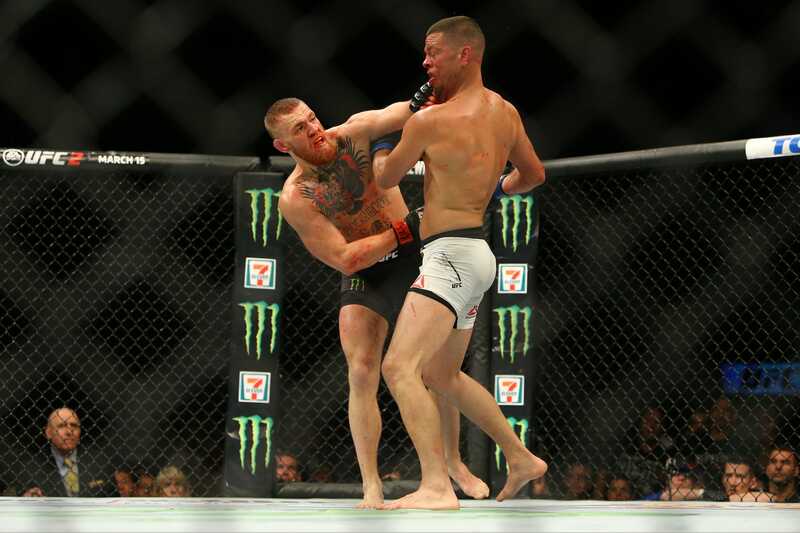 2: Conor McGregor’s star was massive by 2016 but it was Nate Diaz who shone the brightest. 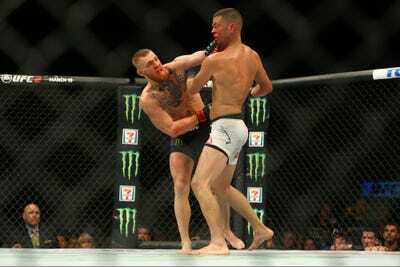 Diaz out-slugged McGregor before locking in a rear-naked choke and winning a shock submission victory at UFC 196.